Armchair PR experts get lots of mileage from critiquing crisis management by major brands and businesses this time of year. 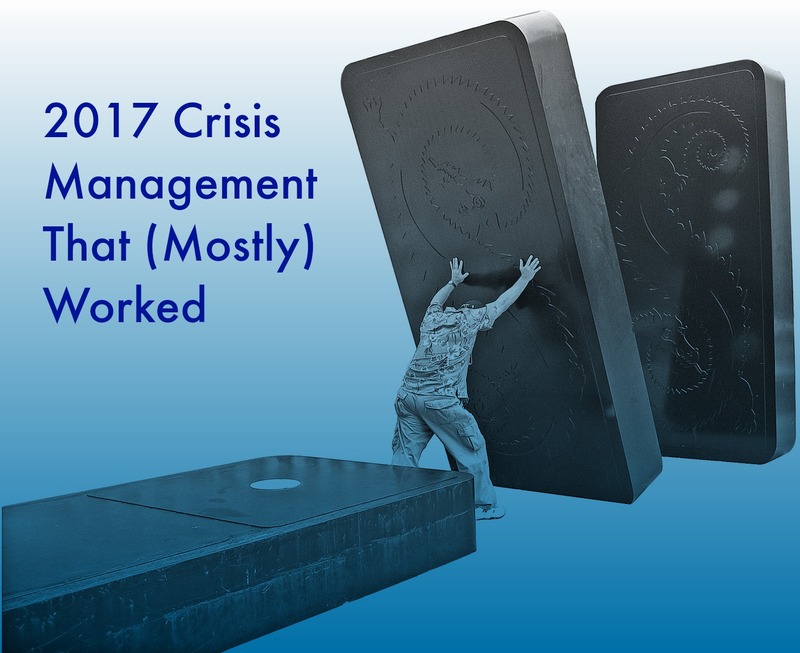 But what about the crisis situations that are handled well? Those instances are less clear, presumably because we don’t hear about the bad news that never hit the press. But in the spirit of fair play, here are some examples of reputation management that succeeded in 2017. Remember the short-lived Pepsi ad starring Kendall Jenner? It seems almost quaint now, given the explosion of reputation-killing headlines that have followed the brand “scandal.” Yet Pepsi’s fast action helped stanch the outpouring of criticism that the commercial was tone-deaf and trivialized true social activism. The ad itself fizzled, but Pepsi’s apology was a win. It was well-crafted, on-target, and even included Jenner in the mea culpa. Most importantly, the brand took full responsibility for the misfire and backed up its words by pulling the ad. It will be remembered primarily by marketing and PR professionals. Well handled. Everyone recalls the PR fiasco United Airlines experienced when footage of a dazed and bloodied passenger being dragged from his seat went viral. But consider how Southwest Airlines handled a tricky passenger situation in September. A woman who noticed two dogs on her flight claimed to have a life-threatening pet allergy, yet wouldn’t leave the plane. Police were called, and when she couldn’t produce necessary medical documentation for her claim, the airline had her taken off the flight. Her exit was captured on other passengers’ cell phones and enjoyed a brief viral moment on social media. Even though it was within its rights to deny boarding to a passenger who couldn’t travel safely with animals, Southwest acted swiftly to contain the damage. It issued a formal apology to the passenger the very next day and reached out to her directly to make things right. Fast action and a sincere statement of regret helped resolve a situation that could have grounded its reputation. The speed whereby the #metoo movement has toppled boldface names in journalism, politics, and entertainment is breathtaking, and major media companies have not been spared. In the wake of Matt Lauer’s firing for sexual misconduct, NBC will be scrutinized for what it knew and when, but it’s hard to fault the network’s handling of the announcement itself. Lauer’s visibly shaken co-hosts Samantha Guthrie and Hoda Kotb faced a live television audience within hours of learning about Lauer’s ouster. Guthrie eloquently conveyed her conflicting personal emotions while being respectful to those who had come forward to end her colleague’s career. The “Today” Show’s ratings are up sharply since Lauer’s departure, ironically. The sincerity and honesty of the on-air disclosure may be why; it humanized the network talent and drew viewers into their experience in real time. One company that may have escaped the brunt of the cultural shift on workplace harassment – at least for now – is online lending startup Social Finance, or SoFi. A fintech darling, SoFi has grown rapidly, exceeding $4 billion in student loan and mortgage refinancing and building a reputation among millennials by hosting local-market social events for customers. So when a wrongful dismissal suit brought to light allegations of sexual harassment and faulty loan application cancellations, SoFi faced a dangerous situation. It responded aggressively to the allegations, pointing to an internal investigation that cleared the company on its loan cancellation policies. Yet as the drip-drip-drip about sexual misconduct by founder Mike Cagney grew, the board pressed Cagney to resign, and he ultimately did. SoFi may have gotten lucky with the timing of its crisis, and its troubles could have been overshadowed by those at better-known companies like Uber. But Cagney’s resignation removed a lightning rod from a situation that could have been far worse. And then there’s Uber. It was beset with not one, but many reputation scandals this year, and the crisis isn’t over. But like SoFi, Uber accomplished one important thing during 2017; it replaced controversial founder and CEO Travis Kalanick with respected technology executive Dara Khosrowshahi. With Kalanick’s exit, some of Uber’s negative baggage departed also. But unfortunately the new CEO was immediately confronted with a fresh crisis – the disclosure of a 2016 security breach resulting in the theft of data from 57 million customers. What’s more, Uber covered up the breach after paying a six-figure ransom to the hackers to delete the stolen data and disguised the payout as a “bug bounty” for testing software. Khosrowshahi’s blog post detailing the situation and the planned fixes represents a good first step in managing the situation. But there’s no doubt about it; he has a long way to go before full confidence in the Uber brand will be restored.